Earlier today a friend at work had mentioned that he had BBQ from a local restaurant. Calvin T’s. I’m not much of a BBQ sauce fan so I had always stayed away from this place. When talking about it he kept expressing how “divine” the coleslaw was, and it was just the way he liked it. So, I got curious. I decided to try it for myself. After work that night I took a drive in town not fully committed to the idea that I wanted BBQ. I drove passed it once, still unsure, I said to myself “oh just go in there you don’t know if you like it till you try it.” So I made a u-turn and drove into their parking lot. The front entrance had a real rustic theme to it, with twinkling lights hanging, older western props, a old carriage to take pictures on, a huge wooden chair big enough for at least 4 kids to sit on at once, a funny outhouse with a hillbilly in it, and a really cool koi pond! I could hear music playing, pool table balls being pocketed, and a good time before I walked in. It wasn’t a full service place, but more of a hot table dinner. 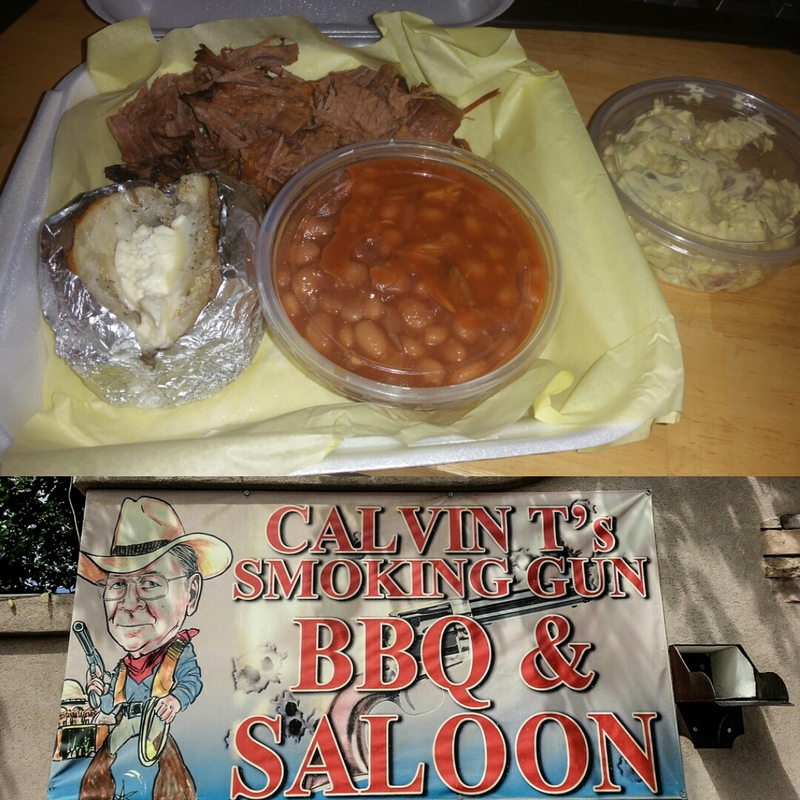 I chose to get the brisket dinner which came with a baked potato, beans, and a choice of one side, I chose potato salad. (Never really liked coleslaw) I was by myself, so I didn’t really want to stay and eat it there so I had it to go. What was really cool was that they had some foreign exchange students working there, I didn’t get to ask where they were from, but they were very nice. While my food was being packed I got to serve myself the baked beans in my to-go container. Normally baked beans aren’t my thing either just because I don’t like BBQ sauce, but I decided to try it anyways. Worst that could happen was I didn’t like it right? My meal came out to $19.61 without a drink. That was a little steep for me, but then again it was brisket so I understood the cost. So I payed the nice lady and was on my way home ready to try it. I arrived home, I was nervous that this would end up being a cheap flavor meal and not getting my money’s worth, but I still continued with the plan. The first bite was actually good! The meat was very soft, tender, a little dry but only because I don’t like BBQ sauce. The baked potato was delicious, the inside had such a soft texture, I hardly had to put pressure on the sides to mix it up. My favorite part was the potato salad. Potatoes were perfect, the onions and celery added a nice crunch, and the sauce was creamy and tangy! Twas’ perfect. My least favorite part was the beans, I gave it a fair shot even though I’m already partial to not liking them because of the BBQ flavor. I had a nice amount of bacon in it, good flavor ill admit, what I didn’t like was the the beans didn’t seem to be cooked all the way. They weren’t crunchy, but they definitely soft either so I left those alone after the first taste. I think I would probably go back maybe try something different, but there menu is so small that I’m sure in with a couple more trips i would have tried everything. There is the website if you want to look at the menu yourself. I’ve hear the Rocking V Cafe might be good. Have you tried it it? Yup, I sure have, one of my blogs is about the Rocking V. They are really good!